Karen Adler: Hi, I'm Karen Adler. Karen & Judith: Red, White, and 'Que. Suzy Chase: You two are the barbecue queens, experts on grilling and barbecuing. I've lost track. How many barbecue cookbooks have you put out together? Karen Adler: Together this is lucky number 13. Suzy Chase: How did you get started as a team? Judith Fertig: We're part of an all-women barbecue team, the 'Que Queens, and we competed against a men's team a couple of times, and we won most of them, so we bottled our own barbecue sauce, and we kind of learned from the ground up, but after a while Karen and I kind of branched out and did our own thing because we're cookbook authors, and we kind of took it in that direction. Suzy Chase: Do you find that women are grilling more these days? Karen Adler: Yes. As each year goes by, more and more women are grilling inside and outside. They are finding that it's a quick, fast way because you're going to use high heat when you grill a boneless, skinless chicken breast, or you want to grill a hamburger, even, and what women are doing is they've embraced grilling the vegetables and the fruits along with their protein source. Judith Fertig: You know, we find with Red, White, and 'Que and with our previous book, The Gardener and the Grill, that we hear from more and more women that say, "Finally!" No matter who grills, whether it's their husbands or their partners or whoever's at the grill, that they can do more than one thing, that they can, if they're doing chicken or fish, they can also do vegetables at the same time, and that's how women think. It's like they try to do more than one thing at one time. Karen Adler: We're fixing the whole meal. Suzy Chase: We do it all. Karen & Judith: Yes, we do! Suzy Chase: So this cookbook celebrates grilling from the garden. In your salad chapter, you have 17 recipes. Describe your grilled Romaine recipe from page 93. Karen Adler: Well, it's one of our favorites, and we've been grilling Romaine for years, and it's so simple, but what's nice is to get a little bit of a head start in the day. Take your hearts of Romaine and cut them lengthwise, leave the stem intact, rinse them, dry them on towels, and then when they're nice and dry, you're ready to grill. They can even go back in the fridge to chill them up a little bit. Okay, so, time to grill over a hot fire, a little bit of olive oil and salt and pepper brushed on the cut side, and then cut side down over the hot fire, keep the lid up on the grill, and you're going to grill them for about two or three minutes until you get these beautiful, charred grill marks, and then what I love with this recipe too, Judith, is the smoky blue cheese dressing. Judith Fertig: And that's really good. Smoky blue cheese or any kind of dressing really tastes good on this. What's great about grilled Romaine is that you get the flavor of the grill, but the crunch of the lettuce, so it's really very good. Suzy Chase: Do you serve it warm or do you wait for it to cool off a little bit? Karen Adler: No, serve it right away because you don't want it to get too wilted, and it's a last-minute prep, but the nice thing is, for anybody doing this last-minute, it grills with a snap of a finger so quickly. Judith Fertig: And this is one that no matter where your grill is, if you have a grill griddle, in your kitchen you can do this on the grill griddle because you're not heating it up for a very long time, so it's an indoor/outdoor thing. Suzy Chase: I love how you put a little gourmet twist on all of your barbecue recipes. I saw your piece on the TV about your summer grilling tips. Tell me about grilling lemons and limes. That's something that you really never think of. Judith Fertig: No, and it's amazing that we think of lemon and limes as very, very sour, but they have fruit sugars also, and so when you cut a lemon and lime in half and you grill it cut side down until it gets good grill marks, it caramelizes the sugars that are in the fruit, and then you get this wonderful sort of caramel citrus flavor, whether you use that in a vinaigrette. It makes a dynamite alcoholic drink, like a grilled lemon whiskey sour. It would be great in a margarita, grilled lime in a margarita. Karen Adler: Grill it alongside your fish or your chicken and then just squeeze that warm lemon, which gives you twice as much juice, and it's really supple, and the flavor just can't be matched on fresh lemon or lime. Suzy Chase: Tell us about your patio pizza. Karen Adler: Yeah, and that's the easiest one, flatbread. Judith Fertig: That's the easiest one. It's easy to say flatbread because then it can be any shape. If you say pizza, people expect a perfect circle. So, you can have a flatbread that looks like Afghanistan and that's fine. Karen Adler: And the flatbread's fun. You can do handheld flatbread, or you can do a bigger piece. Mine usually looks like Florida. Judith Fertig: Yeah, you need a pizza peel. So that was just a really fun project. Karen Adler: Because you can get wood-fired oven pizza without a wood-fired oven in your own backyard in your hot, hot grill. Judith Fertig: Yeah, it's really easy. Karen Adler: And we like it because then you can do those exquisite toppings. One of them we have, it's just so simple. It's to spread a little bit of lemony aioli on top of it and sprinkle some pistachio and ... what else do we put on that one? Karen Adler: Oh, yes, it's fabulous! Judith Fertig: We fought over that one. Suzy Chase: Smoke flavor has really taken on a life of its own lately. Talk about different ways we can add smoky flavor to our summer cookouts. Karen Adler: By using wood. Karen Adler: Smoked tomato basil butter! Judith Fertig: That is delicious. So you can smoke little things that only take about 20 to 30 minutes because they don't really have to cook, they just need to take on the aroma of smoke, or you can run the whole gamut and do a brisket that'll set you back about 10 to 12 hours. Karen Adler: And Suzy, there's so many specialty smoked products that you can use to enhance whatever it is you're cooking. The Spanish smoked paprika is widely available now. You can buy smoked salts and peppers. You can even buy smoked sugar. Some of the smoked bitters are lovely and the smoked cheeses. We have a recipe in Red, White, and 'Que for smoking ice cubes. Judith Fertig: That's adds a little something interesting to a Bloody Mary or any kind of a drink. Karen Adler: You smoke the water and then you freeze that smoked water and you've got the smoked ice cubes. Suzy Chase: Did you know liquid smoke was created in Kansas City? Karen Adler: No, I didn't, but you know, used sparingly, it's wonderful, but way back when, there were these horrible recipes where people would take a whole bottle of liquid smoke and pour it on a brisket. That was nasty. Suzy Chase: It started out as a meat preservative, so a whole bottle sounds awful. Suzy Chase: Let's talk about wine pairings with barbecue. What wines work best? Karen Adler: Well, a few years ago, we were judging at a Gnarly Head backyard barbecue contest, and they served this fabulous Old Vine Zinfandel. It's a red Zinfandel, it's not the pink, sweet Zinfandel. Day in and day out, the Zins are perfect with the smoky meats and the barbecue sauce. But you can also pair whatever it is you like, and Judith, you have more on this too. Judith Fertig: Yeah, I like, if you're going to grill a really wonderful steak ... I'm a person that, I like a little char, so my perfect steak is charry on the outside and rare on the inside, and sometimes that's called "Black and Blue." A Pinot Noir is really good, but then there's for grilled things, and grilled things, I think, call more for a white wine, a crisp, white wine. Or what's perfect in the summer is a really crisp rose. Suzy Chase: Something in this cookbook that I had never heard of is "stir-grilling." What's that? Karen Adler: Stir-grilling is using a perforated grill wok or grill basket. What's good about these baskets and woks is that you can grill tiny pieces of food, so if you want to chop up your vegetables and you want to have pieces of something tender, like pork tenderloin or chicken breast or small pieces of fish or seafood, you marinate them, then drain the marinade, pour everything into the perforated grill wok, and use paddles to stir-grill it over a hot fire. So, we wouldn't call it stir-frying because we've eliminated the grease, the oil, for frying, and it's just this wonderful, much healthier way of still getting that Asian influence if you're using any kind of an Asian marinade, but it's got the charry grill from it too. You can get a big basket and stir-grill a dinner for four in a big basket, and then a smaller basket's going to grill for two or three. And the holes that are stamped into both of these products are about a half an inch, and they're all over, so that you still can get the grill fire and the smokiness into your stir-grilled recipe. Suzy Chase: Farm fresh food for the American grill is where it's at this summer with Red, White, and 'Que. Where can we find you on the web? Judith Fertig: And judithfertig.com, so we're just everywhere. You can't avoid us. Suzy Chase: Before we wrap up, I must mention that I wouldn't be here today without Karen Adler. Karen took a chance on me and gave me my very first cookbook publicity job in Kansas City in 1993. Then I moved to New York City to do national cookbook publicity in '96, and I owe my love of cookbooks and this podcast to you, Karen. Karen Adler: Oh, please, stop. 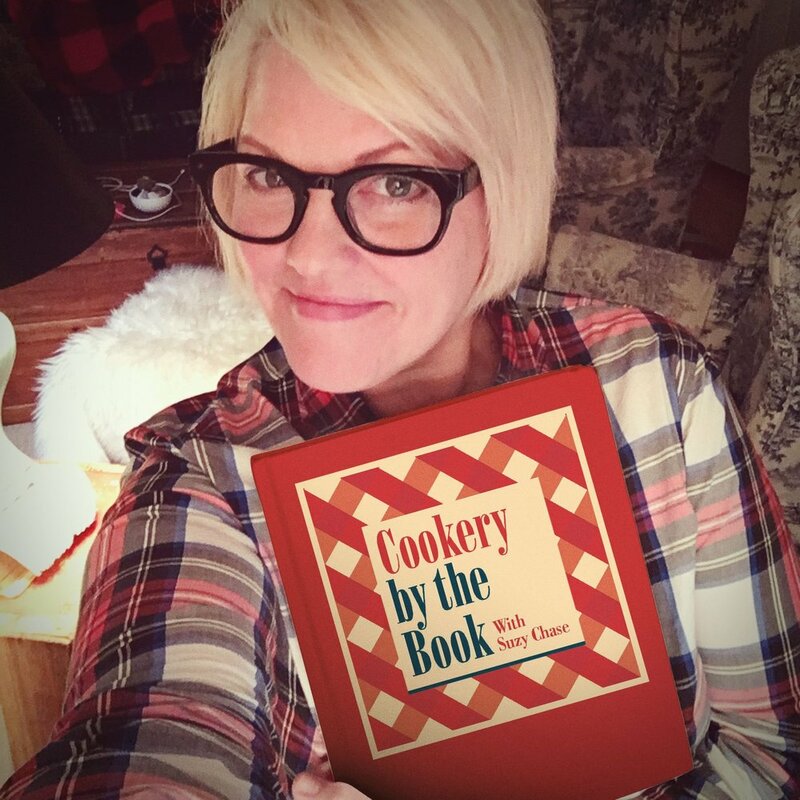 Suzy Chase: I can't thank you and Judith enough for coming on Cookery by the Book Podcast. Judith Fertig: It's our pleasure, Suzy. Karen Adler: And we wish you all the luck in the world, Suzy. We loved being with you today. Suzy Chase: Subscribe at iTunes and follow me on Instagram @cookerybythebook, on Twitter @iamsuzychase. Thank you so much for listening to Cookery by the Book Podcast!